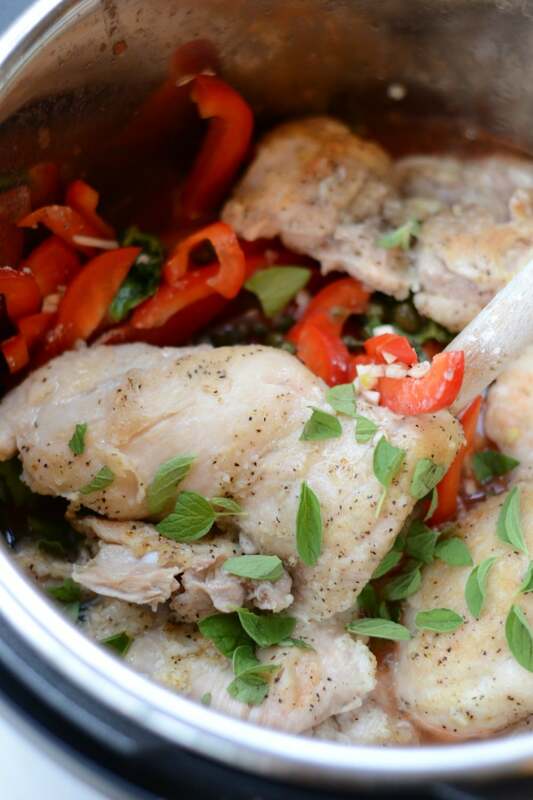 If you’re looking for an easy Instant Pot chicken recipe, this is it! 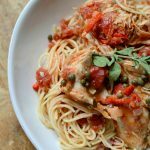 Chicken cacciatore typically requires hours on the stove, but Instant Pot Chicken Cacciatore is done in less than an hour. The best part is that it still tastes like it’s been simmering for hours on the stove. The past month has been a bit chaotic in our house. Between kids’ activities and my husband’s work and travel schedule, we’ve sort of been in “running around like a chicken with its head cut off” mode. While it’s normal to go through phases like this, I struggle with the fact that it goes against my primary goal, which is to SIMPLIFY. When it comes to food, I’ve let go of making trips to some of my favorite, out of the way stores in the interest of saving time. As for outsourcing, I’ve embraced grocery delivery, and I’ve also outsourced a lot of my cooking time to my new Instant Pot. The Instant Pot has made it a lot more feasible for me to make good, nourishing dinners on a busy weeknight, when we’re all in need of a good sit down meal and a family conversation. So let’s get to this easy Instant Pot chicken recipe. 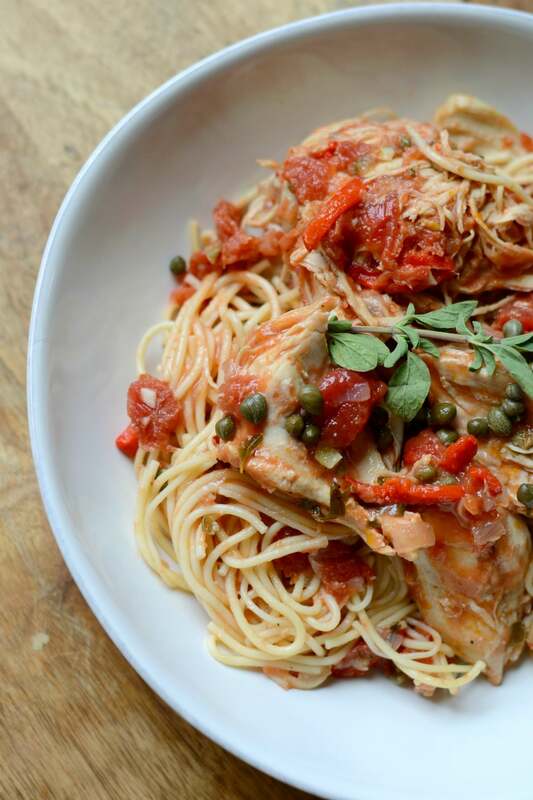 I’ve made chicken cacciatore several times before, always to rave reviews. But it’s a recipe that typically requires a little TLC. Here’s the thing about giving a recipe an Instant Pot makeover — depending on the dish you’re making, it may not drastically reduce the overall cooking time. BUT it will drastically reduce the amount of work you’ve got to do. This dish is a good example…to make chicken cacciatore, I used to have to dredge and saute the chicken, then separately saute the vegetables, then add wine and reduce, then add the other ingredients, then simmer some more, then add the chicken back in, then cook and monitor until the chicken was falling/apart tender. For the Instant Pot version of chicken cacciatore, I just sauteed the chicken (in the Instant Pot), and then basically dumped everything in there and turned it on. So while it may still take about 40-45 minutes start to finish, you’re spending a lot less of those minutes standing over the stove. That, my friends, is the magic of the Instant Pot. 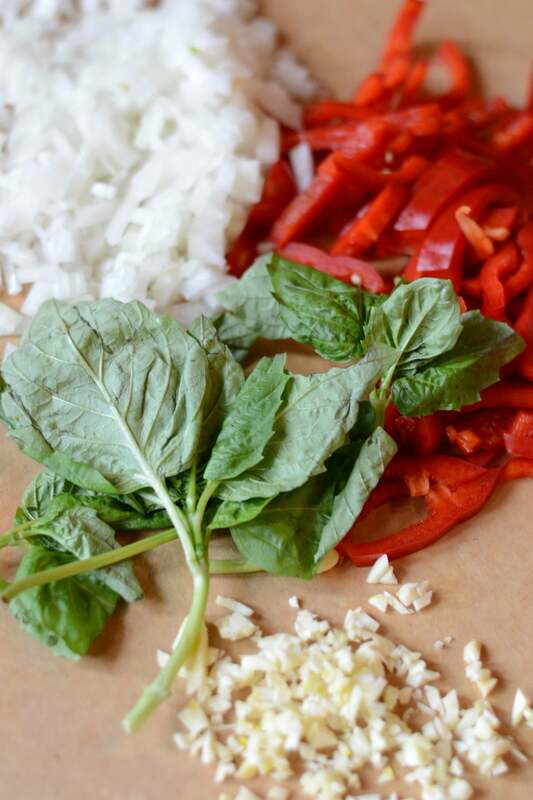 I use a combination of boneless chicken thighs and boneless chicken breasts in my chicken cacciatore. If you prefer one over the other, you can modify accordingly. And if you’re looking for a low carb Instant Pot recipe, this is delicious on its own. Or, you could serve this over zoodles instead of traditional pasta. 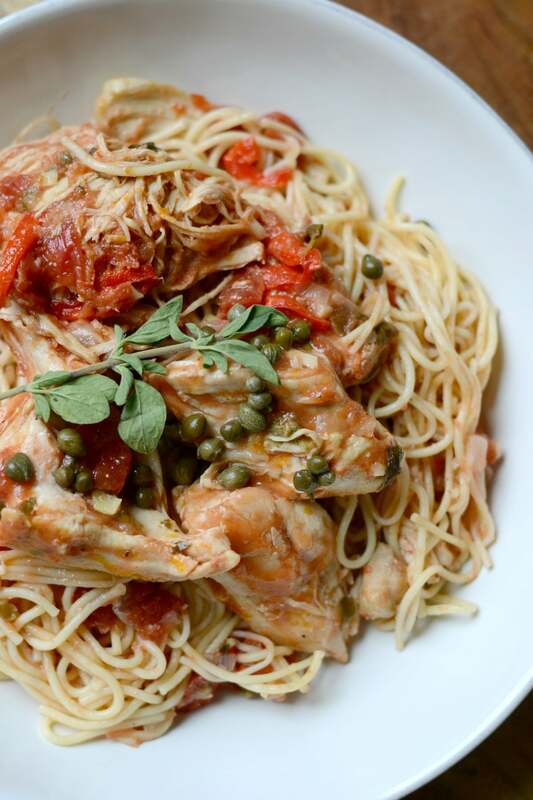 Easy and delicious chicken cacciatore in the Instant Pot. It done quickly, but tastes like it's been cooking all day. In a shallow dish, combine the flour with a few shakes of salt and pepper. Dredge the chicken thighs in the flour mixture. Turn on the saute function in the Instant Pot. Drizzle in some olive oil and saute the chicken thighs on both sides until the outsides are no longer pink. Remove to a plate. 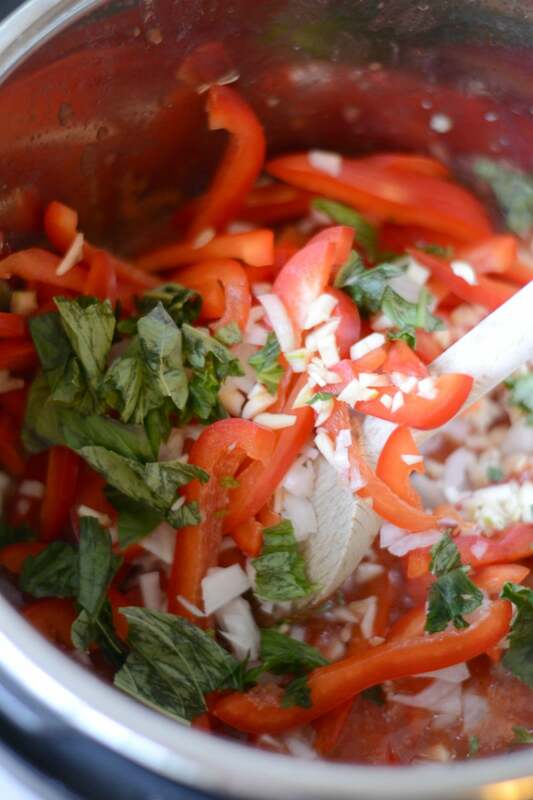 Add the bell pepper, onion, garlic, white wine, broth, capers, herbs and tomatoes to the pot (keep it on the saute function just for a minute or two and use the liquid to deglaze/scrape up the chicken bits from the bottom of the inner pot). Turn to "off." Return the chicken thighs to the pot and add the chicken breasts. Close the lid and manually set to 10 minutes on high pressure. (Make sure steam valve is in the "sealed" position). When the timer goes off, release the steam valve, using proper precautions. Open the lid and stir. Add 1 tsp salt (or to taste). Let sit for a few minutes to allow the sauce to thicken. If you want to thicken it further, you can set to saute again. If you want the sauce to be thicker, drain some of the liquid out of the tomatoes before adding to the pot. So you dredge and brown the thighs, but then add the raw, unseasoned chicken breast? Or did I miss a step?